LAN Airlines was founded by parent company LAN Airlines S.A. in 1929. The airline is based in Santiago, Chile of South America. 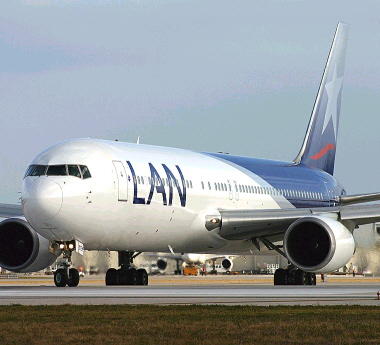 Being the largest airline in Chile and also one of the largest in South America, LAN Airlines is a member of OneWorld airline alliance and flies to destinations across Latin America, United States, Mexico, the Caribbean, Oceania and also Europe. The main hub for the airline is at Arturo Merino Benítez International Airport. LAN Airlines frequent flyer program is known as LANPASS. This program was created to reward customer loyalty. Its member lounge is called VIP Lounge Neruda / VIP Lounge Mistral. 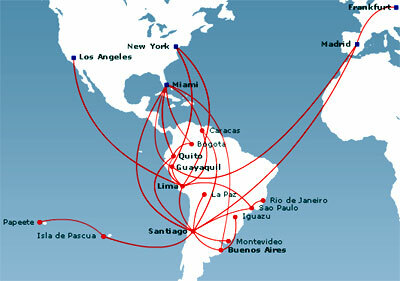 South America AirPass is another program which allows a passenger to pay a discounted rate while visiting multiple South American destinations covered by LAN's extensive South American network.